Being fully prepared to react to an earthquake involves assessing the threat from a number of angles and ensuring you’re ready to respond if the time comes. From knowing what to do in an earthquake through to ways to ensure your home is stocked in the event of the big one, our definitive guide will walk you through the essential components of how to prepare for an earthquake. We’ve all seen the images of the after effects of powerful earthquakes and tremors over the years. From land based quakes through to devastating tsunamis resulting from events out at sea, the resultant destruction that earthquakes can bring about is enormous. If you live in an area that’s prone to periods of severe seismic activity or have wondered how to prepare for an earthquake should an event begin to unfold where you live, then this is the guide for you. Our guide to earthquake preparedness will cover everything you need to know to prepare, survive and thrive, before, during and after a seismic emergency. While the eventual damage caused by an earthquake can be wide-ranging and vary greatly based on local geography, population densities and other factors, it’s important to get a clear understanding of earthquakes from the perspective of what they are and how/why they occur. Earthquakes occur as a result of movements in the Earth’s crust. Prior to these movements, stored energy is built up and like a spring or rubber band, is just waiting to be released. When this finally happens, the seismic waves that expand outward in all directions from the epicenter of the quake (like ripples in a lake if you throw a pebble) are what we feel when the ground shakes and are what ultimately cause the typical physical destruction to property. Underground where the earthquake itself forms, the source of the quake is known as the hypocenter. On the surface above, this center is known as the epicenter – ground zero of the quake on land or at sea. The nearer you are to the center of the earthquake, the more intense the waves and therefore, the worse the destruction. In the event of an earthquake, there are usually a series of ‘shocks’ or actual quakes that occur. The largest of these – the main quake – is what’s known as the mainshock and it’s here that the majority of the damage is likely to be done. With that being said, there are always ‘aftershocks’ which occur, you guessed it, following on from the mainshock. It’s a common misconception that after the mainshock has passed, safety has returned, so understanding and expecting a series of aftershocks is critical knowledge to have on hand during a seismic emergency. To keep a track of earthquakes (and to see just how frequent small tremors and quakes are), check out the USGS Earthquake Map which provides live updates of quakes as and when they happen throughout the world. When an earthquake occurs on land the classic serious damage and effects are caused to buildings and infrastructure. If a quake occurs under the ocean, they can manifest in deadly tsunamis (again, think of the ‘ripple’ scenario) such as the ones that caused chaos in Japan in 2011 and Indonesia in 2004. Of course, we now know that in the case of the Japanese quake, the tsunami was just the start of the devastation that was to follow, with mass-evacuations also occurring after the initial event due to failures in the Fukushima Daiichi Nuclear Power facility and the ensuing disaster which resulted. Some of the areas of the world most at risk of suffering a catastrophic quake are those countries that line the Pacific Rim regions which border an area of tectonic activity known as the ‘Pacific Ring of Fire‘. From Indonesia, New Zealand and Japan in Asia, to California and the Pacific Northwest in North America, this area is a particular hotbed of seismic activity with a ton of quakes and volcanic eruptions occurring regularly. Earthquakes and general seismic activity are measured on a device called a seismograph. When it comes to understanding how severe a quake is, you’ve probably heard of the Richter Scale – but what exactly is it, what does it mean, and using it as a metric, at what point is an earthquake considered serious or life-threatening? The Richter Scale is basically the standard unit of measurement for earthquakes and gives the magnitude of the earthquake – the amount of energy that’s released during a quake. 9+ Devastating quake with waves in the earth visible as they move, barely anything left standing. To put some context into the scale, the 1906 San Francisco earthquake although pre-Richter Scale, is believed to have measured between 7.7-8.3. Similarly the 2011 Tōhoku earthquake behind the tsunami had a magnitude of between 9-9.1. Also known as an ‘Undersea Megathrust Earthquake’, this was the most powerful earthquake ever recorded in the country. Preparing for an earthquake ultimately comes down to focusing on a couple of specific areas of survival skills and preparedness. Primarily, we need to think about earthquake safety, that is, what do I actually do when a quake strikes. Knowing what to do during an earthquake is absolutely fundamental to ensuring the survival of you and those around you. Secondly, earthquake preparedness looks at what to do after an earthquake to ensure continuity into the longer term. This includes preparing your home with supplies, having a grab bag on hand, making a disaster plan and knowing how to react to any number of possible scenarios after a seismic event takes place. While this may seem obvious if you live somewhere like San Francisco or Tokyo, it really does warrant a serious investigation wherever you’re based, as the actual results may shock you, even if your local area has no real history of earthquakes. It’s believed that in the US alone, up to 48 states and territories are at risk of being affected by earthquakes, so a good place to start is by exploring an earthquake risk map before evaluating the level of risk in your specific area. Within your home there are a number of things you can do to mitigate or limit the damage caused by an earthquake and off the bat, you should aim to get these things in hand if you’re living in a potentially at-risk area. Conduct an audit of your home to identify the main areas which would immediately be affected by a potential tremor or quake. Look to secure objects which could cause serious damage or injury first, such as bookcases and large pieces of furniture like cabinets that could fall or topple. Similarly try to remove heavy or sharp objects from high areas like shelves and on top of wardrobes – particularly when these are also close to areas where people sit or sleep. Finally, protect valuable or delicate goods such as electronics (TV, computer screens, porcelain and art works) by securing or relocating them with the same considerations in mind. 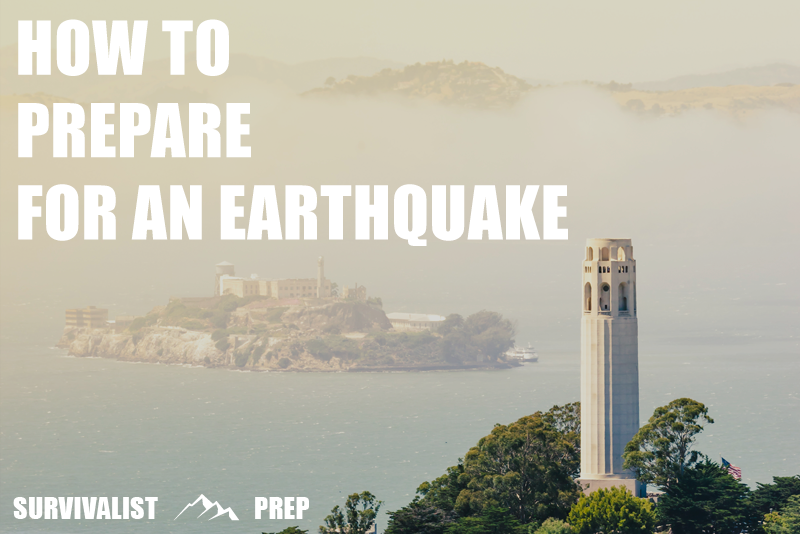 As with all of our preparedness guides, we reference as many expert sources, real world user reviews, and opinions as possible so we’re able to provide the most relevant and educational information on how to prepare for an earthquake. Knowing how to prepare for an earthquake or seismic event is ultimately a highly personal activity with individual needs and preferences sometimes varying considerably between people, locations, and specific situations. With these considerations in mind, this guide looks to provide advice on our own opinions of how to prepare for an earthquake, however, it’s always important to carry out your own due diligence to find the best solution for you when developing a strategy, plan, and solution that’s perfect for your situation.